The Tea Party movement is an American political movement known for its conservative positions and its role in the Republican Party. Members of the movement have called for a reduction of the U.S. national debt and federal budget deficit by reducing government spending, and for lower taxes. The movement opposes government-sponsored universal healthcare and has been described as a mixture of libertarian, populist, and conservative activism. It has sponsored multiple protests and supported various political candidates since 2009. Various polls have found that slightly over 10% of Americans identify as members of the movement. Tea Party protesters on the West Lawn of the U.S. Capitol and the National Mall at the Taxpayer March on Washington on September 12, 2009. The movement began following Barack Obama's first presidential inauguration (in January 2009) when his administration announced plans to give financial aid to bankrupt homeowners. Following a February 19, 2009 call by CNBC reporter Rick Santelli on the floor of the Chicago Mercantile Exchange for a "tea party," over fifty conservative activists agreed by conference call to coalesce against Obama's agenda and scheduled series of protests, including the 2009 Taxpayer March on Washington. Supporters of the movement subsequently have had a major impact on the internal politics of the Republican Party. The movement's name refers to the Boston Tea Party of December 16, 1773, a watershed moment in the start of the American Revolution. The 1773 event demonstrated against taxation by the British government without political representation for the American colonists, and references to the Boston Tea Party and even costumes from the 1770s are common. America's first "tea party" dates to 1773, when angry colonial Americans - fed up with British taxes - dumped a bunch of imported tea overboard in Boston harbor. John Dickerson spoke with a round table of guests about the Tea Party movement and where the movement is headed. 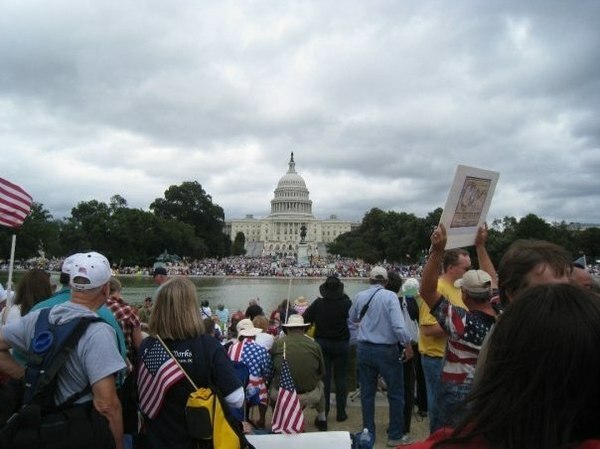 One of the Tea Party leaders, Michael Johns gives some background about the Tea Party Movement and some of the basic tenets.